Can you explain the #MakeKwanzaaGreatAgain hashtag? The Root has started a grassroots campaign to place Kwanzaa at the top of the list of the most important black cultural traditions. Essentially—I know it’s hard to tell our intentions from the hashtag—we want to make Kwanzaa great again. Haha. I’m ashamed to ask this, but, umm . . . what exactly is Kwanzaa? No need to be embarrassed. Have you ever been to an event where white people were celebrating something? If you’ve gone to a birthday party, wedding or church with the whites, then you know Caucasian occasions always start on time and there is a very brief window of celebration. If the invitation says 8 p.m. until midnight, you must arrive no later than 8:07 or they will have already double-dipped into the cranberry guacamole quiche. Black celebrations, on the other hand, tend to start a little later and last a little longer. If your aunt tells you the cookout starts at 2 p.m., you shouldn’t start getting dressed until around 3:30. When you arrive around 5, they will probably begin firing up the grill. On the plus side, whether it is a pastor’s anniversary, a birthday party or a baby shower, most black events don’t end until 2 a.m.
Kwanzaa is like Christmas on C.P. Time. It begins the day after Christmas and lasts until Jan. 1. But that still doesn’t adequately explain Kwanzaa. 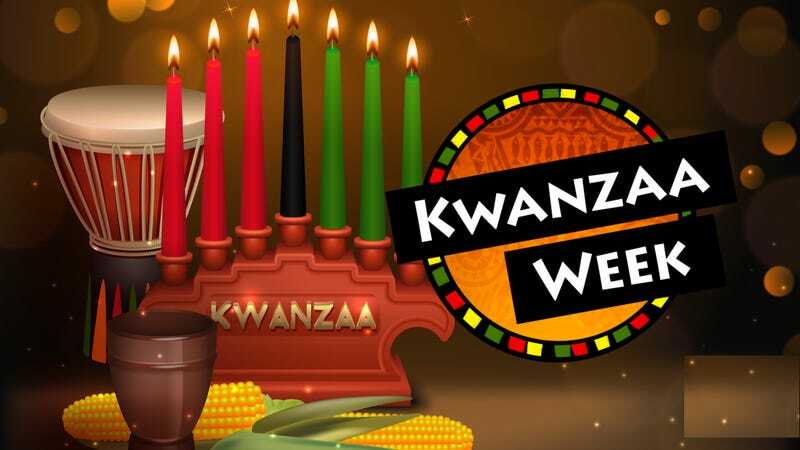 Kwanzaa is from the Swahili matunda ya kwanza—a phrase that either means “first fruits of the harvest” or “kente cloth Christmas.” It was created by Maulana Karenga in 1966 as the first holiday explicitly for African Americans. Although Juneteenth is celebrated by black people, it should really be considered an American holiday, since it’s a celebration of the first time America was truly free for all people. Also ... America is not truly free for all people. Fair point. So why is Kwanzaa seven days long? Umoja (unity): To strive for and to maintain unity in the family, community, nation and race. How is Kwanzaa traditionally celebrated? Most communities celebrate Kwanzaa by gathering at churches, community centers and—in the case of my youth—a funeral home. The people gathered usually show up in dashikis, colorful outfits called “Coogi sweaters” and other African garb. They exchange handmade gifts on each day and light one of the seven Kwanzaa candles on a holder called a kinara. Celebrants discuss unity, togetherness and other topics that Afrocentrics gravitate toward. There is always a local praise dance troupe that performs a West African dance routine that resembles someone catching the Holy Ghost while doing the Electric Slide. The ceremony usually ends with a prayer to white Jesus, followed by traditional African food, like pound cake and lemon-pepper wings. This sounds like a great idea, so why don’t more people take part in Kwanzaa instead of traditions? Remember when you got your Kwanzaa bonus at work? Have you ever gone to a Kwanzaa sale at the mall? I don’t think I’ve ever heard of one. Why does no one play Donny Hathaway’s “This Kwanzaa”? I think you’re trying to be funny. Don’t you gather around the TV every year to watch A Kwanzaa Story on BET? It’s a film about a boy named LeDarius who wanted a Red Ryder BB gun for the fourth day of Kwanzaa and ended up shooting out the eye of a white supremacist, only to be labeled a “black identity extremist” by the FBI. I just looked that up on IMDb and there’s no such thing. Are you being sarcastic? My point is, people don’t celebrate Kwanzaa because it isn’t interwoven into every aspect of the culture. Christmas is. Black people don’t celebrate Kwanzaa because it is a fairly new tradition. Could it simply be that Kwanzaa is a holiday that someone made up? It’s not tied to an actual historical event. It’s just something people decided to celebrate to make themselves feel good. OK, I see what you mean. But your phrase is “Make Kwanzaa great again.” When was Kwanzaa ever great?